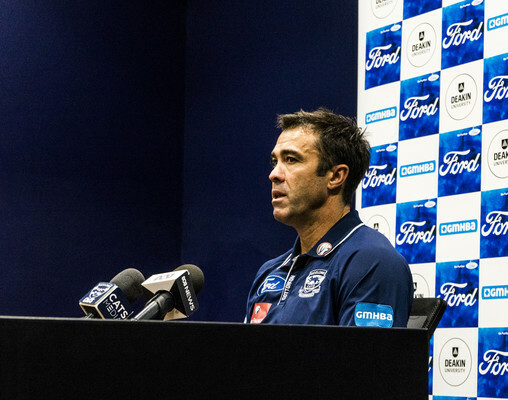 COACH: Cat's Coach Chris Scott at this week's media conference. Picture: Joseph Van der Hurk. Following a nail-biting seven-point win against Collingwood, Geelong faces another challenge with an elimination final rematch against Melbourne on Saturday night. The Cats will make their return to GMHBA Stadium for 2019 as they look to bank their second win of the season. Geelong had three big encounters with Melbourne in 2018, including an elimination final in which the Dees claimed their first final win since 2006. The Cats have a strong record at home against the Dees, winning their past nine from 10 games. Geelong is coming off the back of a round-one win against last year’s grand-finalists but Melbourne began its season with a 26-point loss to Port Adelaide. Cats coach Chis Scott said Melbourne remained “one of the logical premiership favourites” despite the Demon’s first-round loss. “[Melbourne] are a really, really hard and physical midfield group and that’s the way we expect them to play this week, so it will be a big challenge for our boys,” he told this week’s media conference. Scott said the Port Adelaide’s “overplayed” tactics against Melbourne’s Max Gawn last week were unlikely to influence Geelong’s strategy for handling the star ruckman this weekend. “When you’re one of the best players in the competition you’re going to get some extra attention from the opposition. 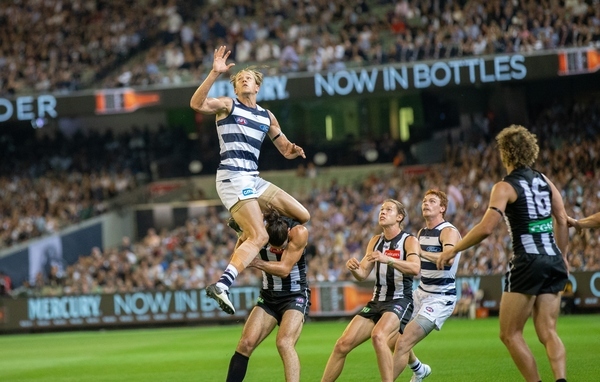 Scott insisted the Cats weren’t getting ahead of themselves following their strong start to the season against one of last year’s grand finalists. “There’s rarely been a team that started round one with success and just kept the same formula all the way through the year,” he said. Patrick Dangerfield (27 disposals), Joel Selwood (25 disposals) and Gary Ablett (23 disposals) played key roles in the victory but Scott said the trio would take on “slightly” changed roles this weekend. “We don’t think that we need to have them front and centre at every single contest to be competitive,” he said. Scott said the Cats were excited to get a “really vocal home crowd again this weekend”. Scott lamented the fact that the Cats would be without star defender Zach Tuohy, who kicked a match-winning goal after the siren in Geelong’s two-point victory against Melbourne in round 18 last year. Tuohy faced another month on the sidelines with a knee injury suffered in the off-season. The club’s early hopes that Tuohy could play round one turned out to be a “really ambitious goal”, Scott conceded. “We just weren’t prepared to push the rehab just so he could start the season,” he told this week’s media conference. Meanwhile, Melbourne will welcome star defender Steven May for his first game in the red and blue when he returns from a one-week suspension.